Posted by Bill Mann on Sunday, April 7th, 2013 at 1:08pm. 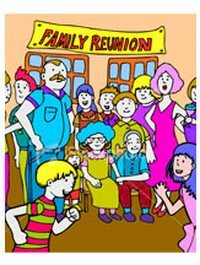 Planning a family reunion can be a lot of fun. However, if some family members live on the other side of the country or the globe it could get a little tricky, so pre-planning and working with a REALTOR® can make finding the perfect spot easy and your family reunion one you’ll all remember for a long time. If you have been given the task of finding the perfect vacation rental home, the first thing you have to do is think about the time of year you will be having the reunion. If it is a wintertime reunion perhaps you want to consider heading to the mountains for some skiing, skating and other winter sports. If the reunion will take place during the warmer months, consider going to the beach. If the decision has been made to have the reunion during the summer months, you may want to consider a vacation rental in Rehoboth Beach. Once you know how many family members are coming including kids, this will dictate how big the home needs to be and how many it can accommodate. Ask how much folks are willing to spend for the week. Once they give you an approximation you will know how much you have to spend. There are numerous vacation homes in Rehoboth Beach that can accommodate large reunions. After you have found several homes that fit your accommodation needs then it is time to get to the nitty gritty of the home. Is it smoke-free? Do they allow pets? Is there a first floor bedroom? Consider any and all of the special requests you and your family may need that are deal breakers and start ruling out homes that way. Once you have these questions answered, you then can decide on the location. Depending on how many homes from which you can choose in the Rehoboth Beach area, you will have to decide how close to the beach you want to be and price will be a large contributing factor. If there is a perfect rental house close to the beach but the price is too high, don’t rule it out immediately. Ask your family if they mind pitching in more, you may be surprised how many are willing to pay a little more to be able to walk to the beach and enjoy the sounds of the waves at night. Once you have found the perfect rental home, you are then able to start planning the activities you all will enjoy once you arrive. Rehoboth Beach boasts many great shopping and dining experiences for those days when you don’t want to be at the beach. There is an amusement park, mini golf and other family fun attractions that can be enjoyed by all ages. The boardwalk is a fantastic place to walk and spend the late afternoon playing arcade games after a fun filled day at the beach. And, of course, the beaches are perfection. Everyone will enjoy relaxing on the beach, playing in the surf, strolling at night and planning dinners by the water’s edge.